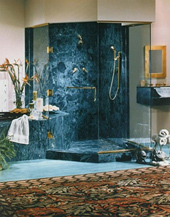 At Reston Glass, our goal is to design the finest shower and tub enclosures available anywhere in the area. We are proud to share we have happy customers all over Northern Virginia Including Manassas, Bristow, Dumfries, and all along the Prince William County Parkway. Meticulously crafted to fit any application, our enclosures incorporate superior features for outstanding performance year after year. 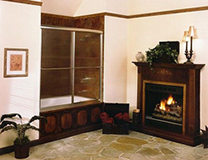 And Reston Glass offers a spectacular selection of glass and frame options to complement today's diverse bath decors. It's this commitment to excellence that makes us confident in your satisfaction. If you're looking for the finest enclosures with unprecedented value, choose Reston Glass where we use Alumax Products! 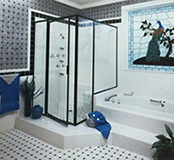 Our selection of framed, frameless and custom designed shower enclosures will certainly meet and exceed your expectations. We carry specialty heavy glass door hinges to ensure safety and continued smooth operating doors. The Alumax DesignLine Heavy Glass Hinge System provides for an almost infinite variety of custom shower door configurations. Using Glass to Wall hinges single door installations are possible. Additional hinge styles, clips, channels, and polycarbonate seals allow door configurations with side panels, buttress panels, and return panels in almost any combination to fit your needs. Hinges and accessories are available by special order in White Powder Coat finish, Polished Chrome, Satin Nickel, Satin Chrome, and Polished Nickel. See the DesignLine Part ID Sheets for illustrations of the available optional components. For more variety, door and panel enclosures may be styled with DesignLine Glass-To-Glass Hinges. Hinges are available by special order in Polished Chrome, Satin Nickel, Satin Chrome, and Polished Nickel. Alumax DesignLine Wall-Mount Hinges create an uncluttered, all-glass look for this 3/8" glass door with a return panel. An optional polycarbonate stop is used to ensure maximum waterproofing. Alumax DesignLine Wall-Mount Hinges create an uncluttered, all-glass look for this 3/8" glass door with an inline panel and return panel. An optional polycarbonate stop is used to ensure maximum waterproofing. A corner shower becomes a dramatic expanse of clear tempered glass as Alumax DesignLine 135 Degree Hinges are used with full-height glass panels to create a custom neo-angle shower enclosure. Alumax's exclusive clear acrylic handles are trimmed to match the brass hinges. For unique applications Alumax DesignLine DL38 Top and Bottom Pivot Hinges provide solutions to otherwise difficult installation problems. Used with Alumax's header and curb system specially designed for heavy glass the DL38 results in a distinctive and functional shower enclosure. 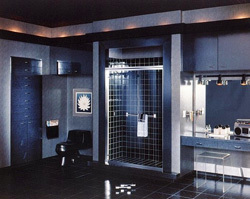 Come browse through our various bath enclosure and shower door products. All units feature durable tempered glass and high quality aluminum and hardware. 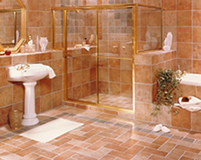 You will find information such as features, finishes and specifications on units as well. Call us today for more information on availability, custom units, etc.